In many ways your front garden provides visitors and guests a first impression of you, your home and your family. It is the first view of your home and a well-manicured front lawn is in many ways reflective of your personality. Your back garden too is important. It is your space to relax with family or entertain close friends. 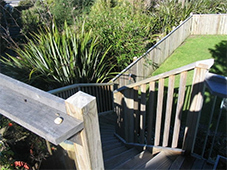 Reid Services are professional landscape developers and can offer you a range of services to help beautify your garden. From small replanting projects to large full-scale landscape architecture, Reid Services is your first choice landscape contractor. Construction of outdoor decks, kitchens, bars and barbecues.